The Braumeister by Speidel is an amazing brewing system, allowing all-grain electric brewing in a compact, all-in-one design. Now, the Braumeister can provide an even more ideal brew day, by controlling the entire brew process from your Windows 7 or higher device! 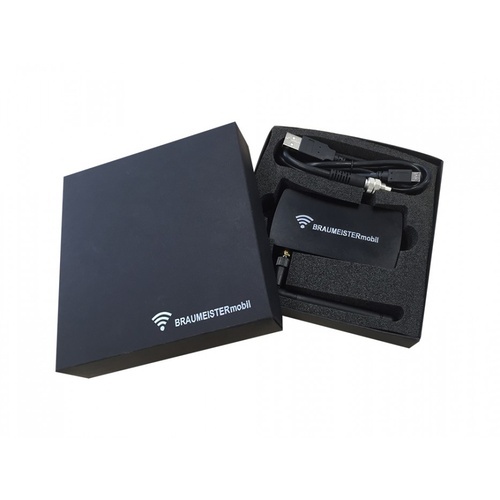 The Braumeister Mobile Wifi Unit is a modular internet connectivity device from Speidel, displaying temperatures and times, running all aspects of the system, as well as updating firmware as released! Please Note: This unit will only function on Speidel Braumeisters with Generation 2 Black Controllers (2015+). YOU CANT USE BRAUMAISTER BLUE TOOTH IT WITH APPLE? You can bring up the display information and perform all the functions in the web browser of an apple product. No App is available to connect.